St. John’s Wort (Hypericum Perforatum) is a herb that grows that grows wild in much of the world. Supplemented for its anti-depressant properties, anti-fatigue and neurological effects. 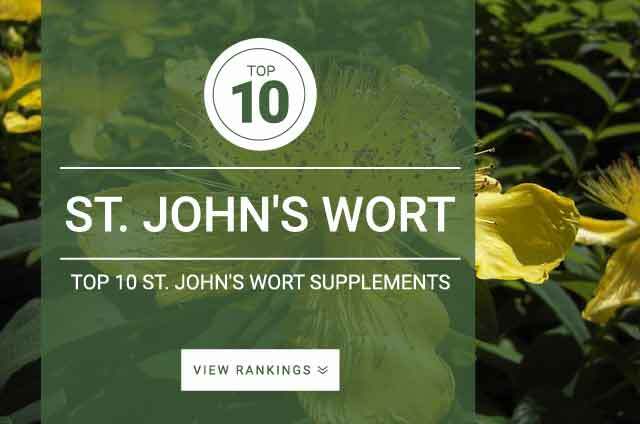 Onlinestrength analyzed 10 best-selling St. John’s Wort supplements in the United States. Our analysis quantified levels of St. John’s wort (hypericum perforatum) extract, standardized hypericin extract, and hyperforin extract. Products that contained effective St. John’s Wort extract dosages with the correct amount of hypericin and/or hyperforin extracts were ranked higher for general effectiveness. Supplements that used vegetarian sourced capsules, organic ingredients, limited to no fillers, preservatives, or binders were ranked higher based on general quality and higher ingredient quality. Samples of every St. John’s Wort supplement passed ingredient quality and purity standards. Higher rated products have less binders, fillers, preservatives, easier to digest capsules (plant-sourced) and higher quality ingredients. St. John’s Wort (hypericum perforatum) is a flowering plant that is found in most parts of the world and has been used as a medicinal herb for the treatment of many healthy aliments. Supplemented primarily for its anti-depressant and anti-inflammatory properties. St. John’s Wort supplementation is also linked to reduction in fatigue, stress, socially induced anxiety, and troubled sleeping. Hypericin and Hyperforin are the psychoactive components of the plant, a natural compound which nutritionally benefits and supports emotional health. Most of the effective human clincial research trails used extract forms of st. john’s wort with approximately .3% hypericin. For maximum effectiveness, St. John’s Wort supplementation takes up to 4 weeks for peek results. Standard dosage of St. John’s wort: 900 mg – 1800 mg of (hypericum perforatum) extract (standardized to contain 0.3% hypericin) taken in divided doses daily. Products that contain hyperforin instead of hypericin should contain 2% – 3% hyperforin. St. John’s wort does not need to be taken with food unless you experience stomach discomfort then you switch to taking it with food.